97% organic. Hypoallergenic. Paraben and SLS free. Not tested on animals. Vegan. BECO is Better Considered; Better for the people who make it, the people who buy it and better for the environment. 97% organic and 100% eco-friendly, vegan, cruelty free and hypoallergenic, every bar is readily biodegradable on the inside and recyclable on the outside in FSC certified recyclable packaging. 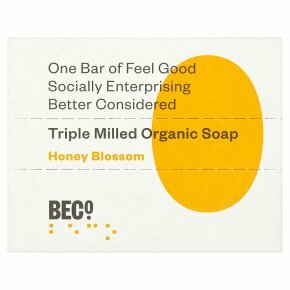 From a not-for-profit social enterprise, BEC? bar soap is made, hand cut and hand wrapped by a workforce of whom 80% are visually impaired, disabled or disadvantaged; and exists to not just challenge the status quo, but to change it for the better. Caution: If soap gets in your eyes, rinse with cold water. P.S. do not eat me, even though I smell good.